Among the oldest lighthouses dotting the Atlantic Coast of Maine stands the towering lamp on Sequin Island, located in normally fog-bound waters a mile off the mouth of the Keneebec River. It also may be the most haunted lighthouse in the nation. Built in 1857, the conical tower and attached keeper’s home were tended constantly by over 70 different people until the facility was automated in 1985. This lighthouse replaced an original lighthouse that was erected in 1795. 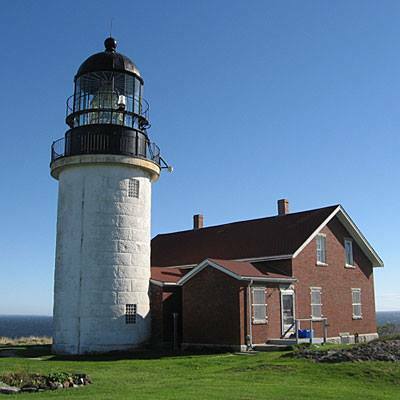 Now listed on the National Register of Historic Places, the lighthouse and island are open to visitors by tourists during the summer months. In the winter it is usually locked in by ice and severe weather, making it an isolated and ultra-lonely place for a keeper and his family to stay. Consequently, few keepers stayed on that job more than a few short years and many left after just one winter of service. The separation from the mainland may not have been the only reason the keepers failed to stay on the job for long. People say the lighthouse has been haunted almost from the time the first keeper, Captain John Polereszky and his assistant, Christopher Pushard, tended the lamp from 1796 to 1802. Over the years it is said that Polereszky’s spirit has been haunting the island and the buildings. Caretakers told of seeing the apparition of the “old captain” pushing things off of shelves and tables, cleaning the brass on the tower, occasionally slamming doors and even turning off the television. When the lighthouse was automated in 1985, the supervisor of the crew hired to move the furnishings out of the house had a vivid dream in which the “old captain” told him to go away and leave his home alone. The next day, as the furniture was loaded into a boat and the boat was being lowered into the water, the cable snapped. The boat and all of the contents fell to the rocks below and were smashed. Polereszky’s spirit is not the only ghost said to be haunting Seguin Island. Visitors tell of occasionally hearing the haunting sounds of a piano playing an old vaudeville-styled tune. They say there is a tragic story behind that phantom sound. It seems that sometime in the mid-1980s one of the keepers arrived on the island with his new wife. The wife had difficulty adapting to the lonely life so the keeper had a piano shipped to the island to give her something to do during the looming winter months. Unfortunately, the piano arrived with only one piece of sheet music. Before more music could be shipped winter set in and she was stuck with that single song. As the story is told, the woman played the same song over and over again. Eventually the keeper got so tired of it he grabbed the sheet music and tore it to shreds. Next he took an ax to the piano. When the wife put up a fuss, he killed her with the ax. Then, out of remorse for what he had done, the keeper committed suicide. Some say the piano story is just a myth and never really happened. But others say they have heard the piano when visiting the island. There is allegedly a third ghost that has been spotted on the lighthouse grounds. Apparently a little girl once died on the island and was buried there. Her ghostly spirit has occasionally been spotted frolicking in the yard and running up the tower steps.